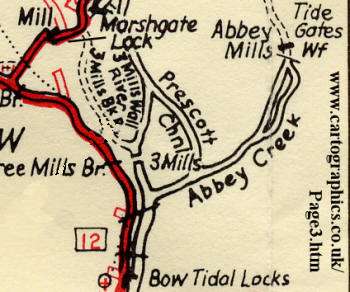 A journey on to the tidal Bow Creek can include a trip upstream past Prescott Cut and Sluice, (above right) built in the 1930’s flood relief scheme and named after Sir William Prescott, the then chairman of the Lee Conservancy Board. The sluice was provided to retain the rising water so that the tide driven wheels at Three Mills could operate over a longer period. This is the site of the new Prescott Lock (above left), rendering the Waterworks River non-tidal and providing access for waterborne commercial construction traffic to the Olympic site. 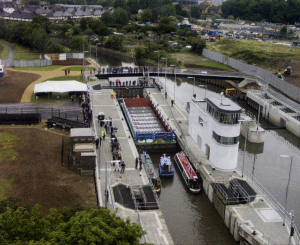 Possibly to save any thoughts of mis-attribution in the future, the name was changed to Three Mills Lock shortly before the official opening on 5th June 2009. At the end of Abbey Creek there is a channel under the Northern Outfall Sewer which used to lead to Abbey Lock Tide Gates and the Channelsea River, which is now culverted between this point and Stratford. There has been a tidal control lock on the site from at least the reign of Edward 1 (1272 -1307), when it was said that Henry de Bedyk, the prior of Halliwell, whose priory owned the Four Mills first erected it. There were early arguments over whether the lock should be allowed to stand, and in 1345 and 1362 juries presented that it should be pulled down. Whatever the short term effect of such disputes were, the lock actually remained. A description in 1416 shows that it was a simple dam with an 18' gap for barges to pass through which could be closed by the insertion of flashboards, and there were no disputes over its rights to exist at meetings of the commissioners appointed in 1551. The owners of the Four Mills rebuilt Bow Lock in 1573. Since the City of London had a close interest in the Lea at this date, it became involved in the work. 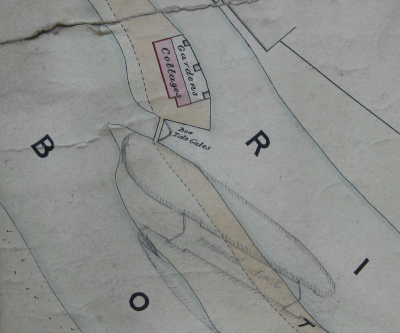 The Dutch surveyor who was preparing a scheme for a Limehouse canal at the City's request was ordered to inspect the rebuilding plans, and a committee was appointed to supervise the actual construction. In 1588 Lord Burghley noted that 'The lock at ye Boo do open at the first begyning to flow They shut it at the highest of the flood' This does suggest a lock with gates opened automatically by the tide. Such an interpretation could be confirmed by complaints in 1581 that at neap tides the height of the incoming tide below the lock was so low compared to the river above that barges could not pass without Bow Lock being opened, yet the lock-keeper, on the instructions of the millers at the Four Mills, refused to do this. Yet by the end of the century there are references to Bow Lock having 'eight rooms' in it, which suggests a dam with removable boards. It is thus possible that a new type of lock had been built in 1573, but that it had decayed and been replaced with the more traditional type of lock by the end of the century. More evidence is necessary, and differing interpretations could be placed on the evidence available. 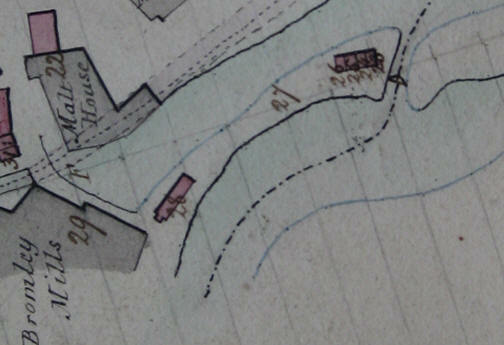 Evidence collected in 1713 shows that in the early 1660s Bow Lock was still a dam with removable. flashboards, and that John Burton 'had 40s a year + the house to look after the flashboards'. Soon afterwards major changes were made to these arrangements by the miller at the Four Mills, Robert Cowden. The sill of Bow Lock was raised two or three feet, a pair of gates were erected, the river above the lock was narrowed from 40' to 18', and a lock above Bow Bridge (Landmylles) may have been removed. 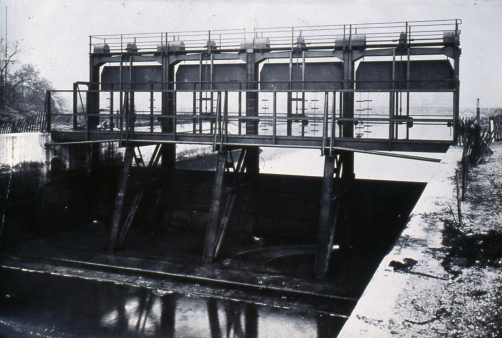 Bow Lock was no longer a dam with flashboards, the principle whereby the gates were open and shut by the force of current of the water had been introduced, and thereafter retained. In response to such complaints George Sorocold suggested that the sill should be laid lower so that the gates could open even at the lowest neap tide, but it was not until Bow Lock was rebuilt in 1721 that the sill was lowered, and then most probably not by as much as Sorocold had suggested. 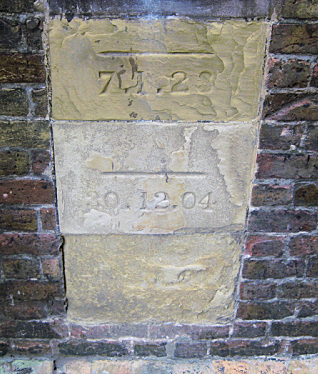 The City hired a surveyor to supervise this work, which was done by the owners of the Four Mills, and marks were made so that the same sill height could be maintained for the future. In 1766 John Smeaton once more recommended that the sill should be laid even lower, and the lock itself be rebuilt with two pair of gates. However no such powers were sought in 1767, and the principle of the lock's operation remained unchanged until replaced by a pair of pound locks during the 1850s. Of the lock above Bow Bridge little is known. In 1551 a 'landmylles lock' stood along the river between Old Ford and Bow Bridge. In 1601 there were complaints about the 'continual lying open of the old lock above Bow Bridge' which suggests decay. During the 1660s it was owned by a Mr Beast(or Best) who died in 'the sickness year', after which the lock either fell into ruin or was pulled down by Robert Cowden when he rebuilt Bow Lock. Apart from Mr Beast, the precise ownership of the lock has not been discovered. Historically it seems to have been the property of a tide mill known as 'landmylles' which had disappeared by the sixteenth or seventeenth century. 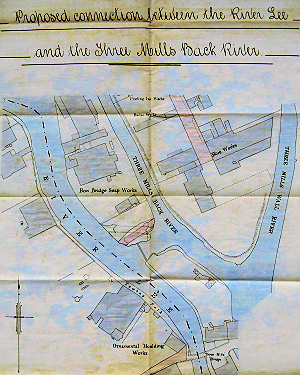 Whatever, its effect by this date was to pen back water so that barges could pass down through Old Ford with less difficulty and more water could escape down the head streams of the tidal mills above Stratford Causey. Its removal after the 1660s may have caused some problems, and during the first decades of the eighteenth century, proposals were made to rebuild this lock, but this never happened. 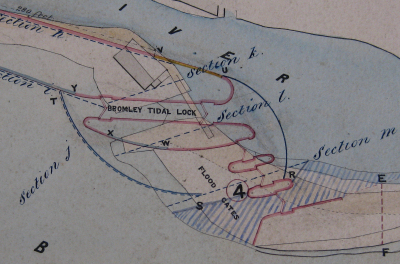 The plan below shows the tide gate with the first proposal for a lock. 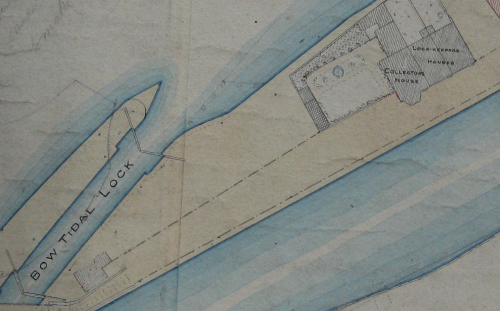 This plan, dated 1851, shows the new pound lock superimposed on the old tide gate. 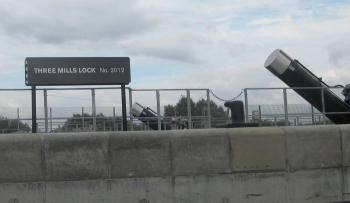 This lock was improved in 1900 and duplicated in 1931, when it was named Neild Lock after the late Sir Herbert Neild, who was the chairman of the Lee Conservancy Board. The state of the Collector's House at Bow gave rise for concern in 1900, when Mr J W Lawrence was promoted from Old Ford Lock to succeed his father as Collector at Bow. 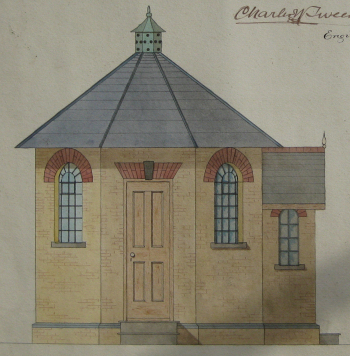 At a cost of £40 a new office was built as an extension and a chimney added to allow fireplaces in the office and the bedroom above. Another occasion when flood waters caused damage (although caused by heavy rainfall rather than an exceptionally high tide) was described by the Charles Tween in his Engineer's Report on 24th March 1916. It is possible to gain an impression of efficiency and good organisation from the tone of the report. "I regret to state Mr R Waters' barge 'Amelia' got "under-laid" under the platform of the West side Tide gate at Bromley -by-Bow at about 2 p.,. (sic) on the 21st. inst, breaking the anchor strap from the bedstone causing the gate to be washed over the "pointings", turned end for end and was held up by the side of the brickwork to Bow Creek. 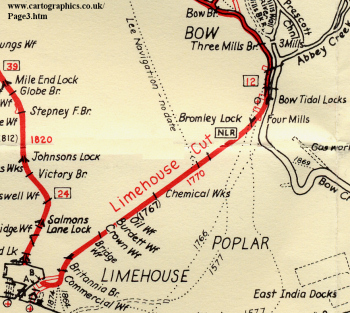 "The gates to the Limehouse Cut at Bromley Lock were at once closed which rendered the Cut safe. I had the dam prepared in the Yard (at Enfield) and the steam barge loaded with the necessary materials and despatched to Tottenham the same night hoping to get to Bromley by morning, but the flood water would not admit of the barge proceeding below Tottenham, so I had the dam timbers loaded on to two of Messrs Iszard's vans and taken by road. After the Second World War, working conditions for the men became far better with the Unions negotiating with employers. The institution of the 48 hour working week created a need for extra men to be employed. The Minute of 8th November, 1946 continues “Some of the men concerned had been working up to a 72 hour week, including mealtimes and in order to provide for the reduced number of working hours it was necessary to engage eight additional men. 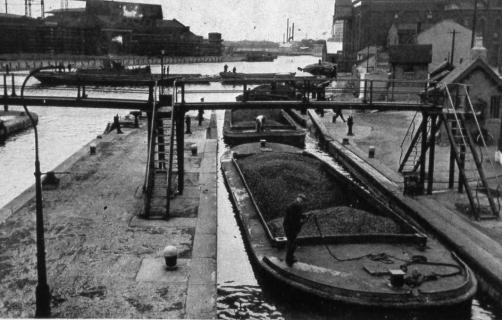 In view of the urgency of putting the arrangements into operation at short notice, seven men were engaged….one was found to be medically unfit but the other men have been appointed subject to three months probation at the minimum wage for the Board’s lock keepers in the London area, viz., £4.7s.0d per week, and will be provided with uniforms if they satisfactorily complete the probationary period. 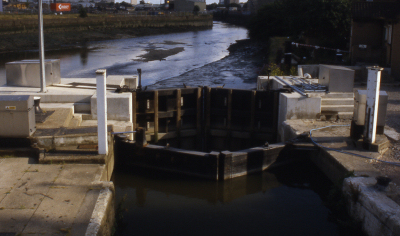 “Two of the Board’s regular men at Bow Locks, W Parlour and H W Bevan, refused to accept the new shift programme and, in protest, returned home on the afternoon of Saturday, 2nd November, 1946, leaving their duties uncompleted, having previously informed the Collector in charge what they proposed to do. They made no effort to put forward reasonable alternative arrangements, although it was pointed out to them that the arrangements already made were provisional and might be amended in the light of experience. Both men were accordingly informed that by abandoning their duties they were regarded as having terminated their employment. They had been reprimanded for similar behaviour on another occasion. There is still a discrepancy of one man, seven having been appointed for eight vacancies, plus the replacements for Parlour and Bevan, but there is no explanation offered. The Minute continues “…Subject to there being no further changes of personnel there are now sufficient men to work the new scheme, the total wages cost of which will be approximately £1575 per annum” (NA Rail 845/127). Although all the new men are listed under Bow Locks, they would have been deployed around the London locks but there is no record of who went to which lock. 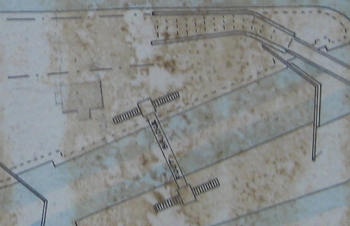 Because of the proximity of Bow Locks and Bromley Locks (which are described on the Limehouse Cut page), it is impossible to separate the staff, so the employees for both Bow and Bromley are shown in the table below. *All lock-keepers and collectors whose names appear in the records but whose location is uncertain are included in the list below. Last recorded r.o.p £5.3.6 n.d.
V L Brimley “went sick on 8.9.1940…doctor states that it is inadvisable for him to return to a bombed area….he suffered from shell shock after the last war and …this illness is a return of his former trouble” “He has moved out of London and made application to be given leave of absence for the duration of the war” (NA Rail 845/124). 8.4.1892 Jesse Lawrence. Bow Lock. Collection of £750 pa . Also supervisor over the two collectors at Limehouse, where the collection is £3000 pa. Private sureties (NA Rail 845/26). £1 per week. Bow Tide Gates and new Bromley Lock. 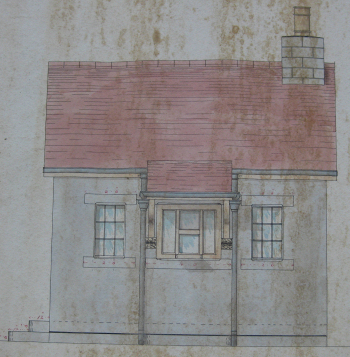 Letter of 13th September 1850 to James Griggs the Surveyor, following the acquisition of Four Mills by the Trustees: “ Sir, The Mill Cottage being now empty and much more convenient for a lock house, I shall feel greatly obliged if you will allow me to remove into it. As the one I now live in is at least four feet below the level of the surrounding premises and from the circumstance of there being no less than seven privies bordering a little yard of about eighteen feet by eight feet, the stench arising from them is unbearable and frequently after rain, the soil runs through the walls which makes it very unhealthy for my family, the children being continually ill. Trusting you will grant me this favour I remain, Sir, your most obedient servant. John Chamberlain” It is gratifying to know that on 17th September 1850, his request was granted.